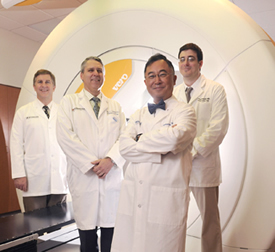 Clinicians and researchers at UT Southwestern involved with the Vero system include (from left) Dr. Robert Timmerman, vice chairman of radiation oncology; Dr. Timothy Solberg, professor of radiation oncology and radiology; Dr. Hak Choy, chairman of radiation oncology; and Dr. Jeffrey Solberg, assistant professor of radiation oncology and in the Cancer Immunobiology Center. The VERO system, the first and only currently operating in the entire Western Hemisphere, allows UT Southwestern physicians to locate and track tumors and more precisely target radiation compared to other technologies. This helps avoid damage to healthy tissues and reduces the number of treatment sessions needed – resulting in better patient outcomes and experiences. Patients at UT Southwestern needing therapeutic radiation have access to 10 state-of-the-art machines: seven linear accelerators, two specialized stereotactic machines (CyberKnife and Gamma Knife) and the VERO – an array of options that distinguishes UT Southwestern Medical Center from other medical centers. The newest system offers exceptional precision targeting, enabling treatment for patients for whom the risk of damage to nearby non-cancerous tissue precludes further use of standard radiotherapy. 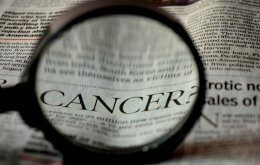 It allows doctors to monitor and adapt to each patient’s anatomy and to precisely coordinate delivery of radiation with natural movements such as breathing, or in response to changes that can occur between treatments, such as tumor shrinkage or weight loss. Because a stereotactic approach allows oncologists to deliver radiation in such a concentrated and precise manner, fewer treatment sessions are needed, Dr. Choy said. Visit the Department of Radiation Oncology or the Harold C. Simmons Cancer Center to learn more about radiation oncology at UT Southwestern, including highly individualized treatments for cancer at the region’s only National Cancer Institute-designated center.